Fraud isn’t uncommon in science. Why people fake data or specimens is a more complicated question. This week we have a story about scientific fraud as revenge. Courtesy of the Heidelberg University Library. Click to view more engravings. Special thanks to the Oxford Museum of Natural History for their help with this story. the also thanks to the Teylers Museum for their help. They have six of the lugensteine on display right now, so if you're in the Netherlands, you should definitely stop by. And if you can read Dutch, the museum featured the stones in their magazine in the 1990s (pages 11-17). 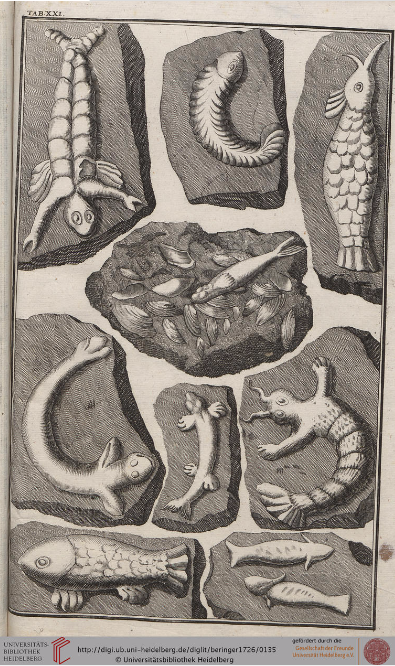 We relied on a few books to write this week's episode, especially The Lying Stones of Dr. Johann Bartholomew Adam Beringer Being His Lithographiae Wirceburgenis by Daniel J Woolf and Melvine E Jahn. In addition to a translation of Beringer's original book on his "fossils" the book also has court transcripts. In 2006 a book came out that proposed that Beringer might have faked the fossils himself. We didn't actually read this one because it's in German and neither of us can read German, but we did read this review of it by Paul Taylor in Acta Palaeontologica Polonica. Music was composed by Malcolm Rosenthal. Artwork was drawn by Jackie Sojico. Older PostEpisode 14: Even Our Garbage Looks Amazing!